• There are digitized circuit court records, covering 29 of Missouri’s 114 counties, mostly from the 19th century, ranging from divorce cases to cases described as involving debt. • And there are also the records digitized as part of the St. Louis Circuit Court Historical Records Project, which features digitized collections of court files relating to Lewis & Clark, Native Americans, the fur trade, and slave freedom suits. And you know what happened, right? I mean, we all could have predicted it. A better question would be, just what kinds of genealogical information won’t be in those old musty court records anyway? When Gardner turned 21, he was to be free of his obligation to work for Frazier, and given 10 dollars and a decent new suit of clothes as his freedom dues. And what genealogically valuable information do we learn from this? • We learn that Frazier was a tanner and currier — since he could hardly have taught Gardner that trade if he wasn’t. • We learn that there was a court order appointing Wilson as Gardner’s guardian — an event that points us to at least the possibility that other records exist about this boy. 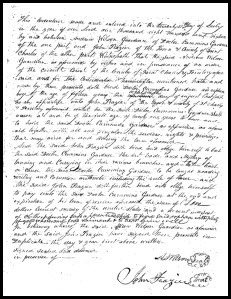 • And we get the full name and the exact birthdate of the boy Doctor Cummins Gardner: “an orphan boy of the age of fifteen years the eighteenth day of August last” — 18 August 1815. Now I don’t know about you — but I’d kill for an exact birthdate of any of my ancestors born around 1815! And this is just one page of one court file… one of thousands Missouri has digitized. The details in these files will show anybody just what we can find in court records — not just in Missouri, but anywhere the records may be found. This makes me wish I had Missouri ancestors. Still very interesting. A nice example of what treasures may be found. Similarly a County Court elsewhere put on record birth information for a bunch of my cousins when binding them out — so there would be a record of when their indenture time was done. Happily their mother was still living and had access to a written memorandum regarding their birth dates. Excellent, Jade! What a treasure in those records! Louisiana has wonderful court records online. Probate and civil cases are my favorites, but there are many others. Through them I get a total picture of what antebellum life was like which wasn’t all “barbecues with the Tarleton twins” ala Scarlett. Many states are moving towards making more and more court records accessible, thank heavens!! What you folks are doing in Alachua County is FABULOUS. I use those records all the time in lectures as examples — it’s an absolutely stunning example of great work by a County!! Missouri Digital Archives are wonderful — and I have to say, the people are just plain nice. Not too long ago, I wrote to the St. Louis branch, asking how I could access a court case that was only indexed on their website. I received a reply that included some 20 pages of scanned documents! They said they were scanning them anyway as part of their digitization program, but I was thrilled that they took the time to send me the ones I was looking for. And yes, they were absolutely fascinating. I wrote the blog about the guardianship records and the value of these records yestreday and the value of them in terms of dates and relationships. Still couldn’t understand the reluctance to research of these records.